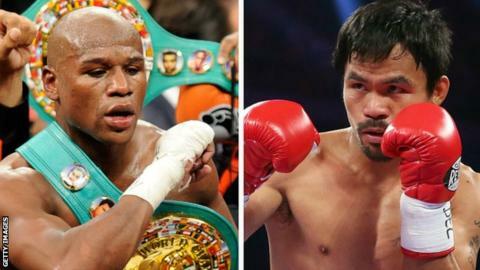 Mayweather's WBC and WBA welterweight titles and Pacquiao's WBO belt will be on the line at the MGM Grand. The fight is expected to generate as much as £162m ($250m). The most lucrative fight in history is thought to be Mayweather's bout against Saul Alvarez in 2013, which made an estimated £97m. Mayweather wrote on his webpage: "What the world has been waiting for has arrived. Mayweather vs Pacquiao on May 2, 2015 is a done deal. "This will be the biggest event in the history of the sport. Boxing fans and sports fans around the world will witness greatness on May 2." Pacquiao said: "I am very happy that Floyd Mayweather and I can give the fans the fight they have wanted for so many years. "They have waited long enough and they deserve it. It is an honour to be part of this historic event. "I dedicate this fight to all the fans who willed this fight to happen and, as always, to bring glory to the Philippines and my fellow Filipinos around the world." Mayweather said "giving the fans what they want is always my main focus". He added: "I am the best ever and this fight will be another opportunity to showcase my skills and do what I do best, which is win. "Manny is going to try to do what 47 before him failed to do, but he won't be successful. He will be number 48." Pacquiao's trainer Freddie Roach, said: "Floyd should enjoy being the A-side while he can. Because on May 2, Manny is going to put him on his backside." "This fight is the biggest boxing can offer by some distance. Las Vegas, festooned with giant portraits of the two rivals all along its Strip, will bow to their cults of personality. Fans will flock from far and wide, rollers will be high, celebrities will be A-list, journalists will be varied and many." Pacquiao beat Chris Algieri on a unanimous points decision in his most recent fight in November, but lost twice in 2013 - to Timothy Bradley and Juan Manuel Marquez. British welterweight Amir Khan, who wants to fights Mayweather and also held talks with Pacquiao in January, said before the bout was announced that it is "not going to be what people expect". He told the Daily Mail on Thursday: "Four years ago it would have been a massive fight because both of them were at their peak. It might have gone past that now. "It will be a good fight for a couple of rounds. I think it will go the distance but that Mayweather will win by unanimous decision." "This fight took about five or six years of negotiations, arguing, egos getting in the way before it finally came to fruition," explained Bob Arum, Pacquiao's promoter. "It's the biggest fight by far in years in the sport of boxing, so I equate this to five or six years of Super Bowls all wrapped into one fight. It'll be the biggest boxing event of all time." "Part of the myth and legend of this entire event is that is took so long to come to fruition," he said. "Maybe a boxer that is just slightly past his prime provides a more entertaining, a more memorable fight than the guy whose reflexes are at their peak."